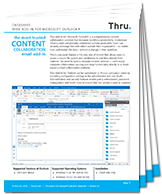 Thru for Microsoft Outlook® is a comprehensive content collaboration solution that increases workforce productivity, modernizes infrastructure and provides centralized content protection. Users can securely exchange files with others outside their organization – no matter how confidential the data – without a change in their workflow. To learn more about the Thru for Microsoft Outlook add-in and how it can be used within your organization, complete and submit the form to download the Thru for Microsoft Outlook datasheet.